Detectives have arrested four men in connection with a viable explosive device left in the Pantridge Road area of west Belfast on October 30 last year. Three men aged 21, 34 and 60 were arrested in Belfast while a 29-year-old man was arrested in Dungannon under the Terrorism Act. Detective Inspector Adrian Brown said: “The device, which was an explosively formed projectile – a weapon that is primarily designed to attack armoured vehicles and kill the occupants within – caused widespread disruption at the end of last year. 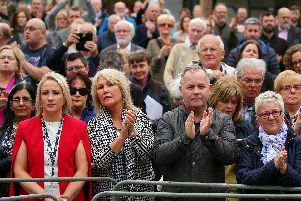 “While it was clearly designed to kill or seriously injure police officers serving the local community in west Belfast, it was left in a position where there was every possibility that it could have killed or maimed members of the public.